Bring a timeless design to your dining space with the Daphne Table & Anthousa Chair Set. 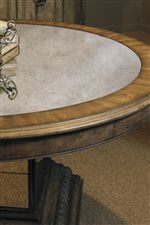 The table features a single pedestal base and fancy face round veneer table top. 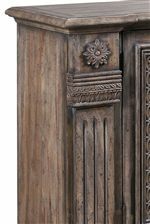 The base is antique urn inspired and is accented with gadrooning. Woodwork features graceful proportions mixed with an aged patina finish, exuding evocative hues and adding charm and character to each piece. Accompanied are two Anthousa Side Chairs. Each features Louis XVI styling and a graceful oval back for a traditional look and feel. The seat and back are upholstered in natural linen for comfort and neutral color tones. It is lifted on pretty slim tapered legs. This three piece dining set is the epitome of understated elegance for a classy presence in your dining space. The Accentrics Home 3 Piece Daphne Table & Anthousa Side Chair Set by Pulaski Furniture at AHFA in the area. Product availability may vary. Contact us for the most current availability on this product. 201007+08 Daphne Round Table 1 60" 60" 30"
205005 Anthousa Side Chair with Linen Upholstered Seat 2 20" 25" 40"
The Accentrics Home collection is a great option if you are looking for Transitional furniture in the area. Browse other items in the Accentrics Home collection from AHFA in the area.